Click on cutting to enlarge. Then click on cutting again. It should enlargen enough to read easily. There must be many now in their 70s who recall the glitz and glam that the Beverly Hills Hotel epitomized. The fairly long trip out of Durban with your date on the then single bush straddled road that lead to Umhlanga. There standing like a beacon, the neon lights on the side of the building “Beverly Hills Hotel”. It stood alone then, the only multi storey building in the area. 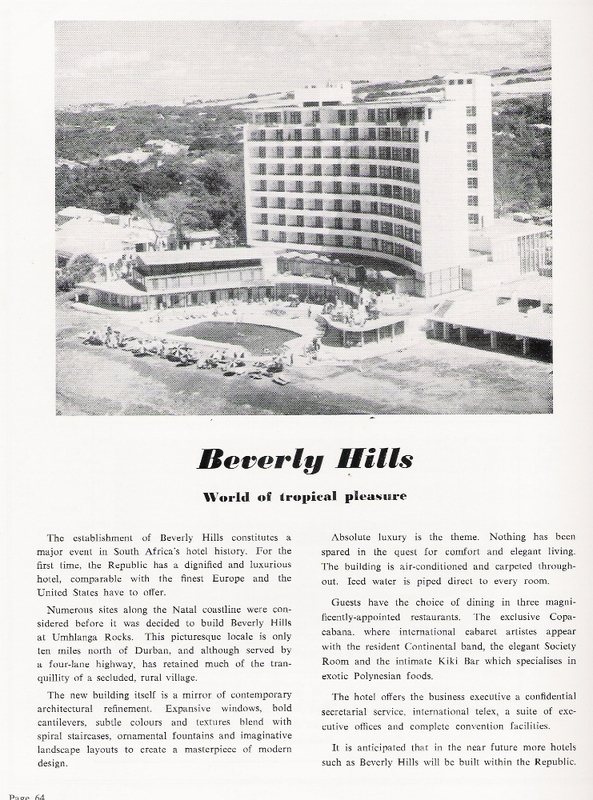 I have some memories of the Beverly Hills Hotel from that period(1966/67) as I used to visit the hotel to attend to faults on the PABX (Private Automatic Branch Exchange) which had been installed. The hotel was one of the first in Durban to have a PABX installed which allowed guests to make telephone calls from their rooms without having to go through the switchboard operator. You dialled “0” for a line, got dial tone and then dialled the number. Guests could also directly dial the dining rooms, nightclub, etc. The PABX was a Plessey, a fairly large one as every room had a telephone installed and there was total inter commun-ication between all the extensions. The PABX equipment room was discretely situated down on the lower level where the pool was. Actually Sol still owes me a lunch! Here’s how. In the 60s, Telkom worked a 44 hour week and because we started at 7.30 am till 5 pm with 1/2 an hour for lunch (not counted as work time!) we knocked off an hour early on Fridays. (You can do the maths). There was no work over weekends except repairs to emergency services. One Friday, I was held up by a particular fault I had been dispatched to earlier and finally drove back to the PABX Section to find everyone had already gone home except Les who was the person who recorded the Incoming Faults. He had stayed behind to get his week’s stats up to date. It was an accepted rule that if the Faults Phone rang after hours , Les would not answer it. However this Friday as I walked in and gave my clear on the fault I had completed, the Fault Phone rang and Les committed the cardinal sin of answering. It was the Beverly Hills and the PABX was doing strange things. Les was talking to a lady who was the maitre d’hotel and trying to fathom out what was going wrong. She was completely baffled and in a distressed state as none of the phones were working properly. He turned to me and asked would I go out. Very reluctantly I said “Okay”, got the yard gate keys from Les, picked up the tool case and headed for my Mini Panel Van. It was a long drive from Stamford Hill to Umhlanga. I must have arrived at about 5 pm to be heartily greeted by the distraught lady and if I remember her name was Maeve Changuion (spelling maybe wrong). We hurried downstairs to the PABX room to assess the situation. As I walked in to the PABX room, all the electromechanical switches which normally whizzed round were dragging round. I immediately got out the voltmeter and measured the voltage across the busbars. It was down below the normal of 50 volts. The exchange was running on its batteries and the batteries were running down. The 220 volt mains were present so it had to be the battery charger. The battery charger trans- formed the 220 V AC input down to 50 volts DC output and kept the batteries at the 50 volt DC level. The battery charger had failed and the exchange load had taken it out of the batteries. In those days PABX equipment belonged to the supplier and all Telkom did was the maintenance of the equipment and the provision of the incoming lines. It was a strange setup in a way but I suppose it was a method of preventing the PABX suppliers from outgrowing themselves and becoming a threat Telkom’s monopoly of the market as it had then. Furthermore, because the equipment belonged to the suppliers they had to provide all spares. Would Plessey, the supplier still be open late Friday, would they have a spare charger? Would the hotel be off for the whole weekend? I got onto the Plessey office immediately. Because of our interaction with all the suppliers we knew their staff well. I also had an inkling that the staff at Plessey would be there as beer normally flowed freely late Friday afternoons. I got hold of one of their technicians and told him of the crisis at the Beverly Hills. He said he would see if they had a spare charger and would phone me back. I then made a decision that was brought to Sol’s attention. I switched the whole PABX OFF. I thought it was doing the PABX no good operating at a falling voltage and the load was just draining the batteries further. You can imagine now the whole hotel internal telecomms off but at least in this state the incoming lines were still operative as they were switched to certain phones which were designated “Mains Fail”. In other words when the power went off completely they operated like normal phones. Plessey phoned back and said they had one spare charger and I would have to come and pick it up. Back into the Minivan and speed into town to the corner of Moore and Sydney Roads, Plessey’s HQ in Bestgard House. Load up the charger, some extra spare parts and fuses just in case and head back to Umhlanga. It must have been after 6 pm that I arrived to a lot of people milling around the foyer. No time to answer questions, straight to the PABX Room, pull out the rack fuses to isolate the equipment from the power, disconnect the faulty charger, replace the new battery charger, switch the new charger on and watch what happens. There was no bang and looking at the electrolyte in the glass batteries the small bubbles that started forming and rising to the surface was a good sign. Now a little time to allow it to recharge before reconnecting the equipment. I must have given it about half an hour and checked that the voltage had come up. It was time to reconnect. Rack by rack was put back into service and the PABX came back to life. I went to the foyer to tell Maeve things should be back to normal. She told me to wait and obviously went to report to Sol because the two of them came back together. He shook my hand and asked what had happened, was it serious, was it stable. I could give no answer as to what had caused the charger to fail at that moment. Then Sol said “come for dinner some time and have it on me”. I never took him up on that. To be honest I only went to the Copacabana night club once. I went with a date and a friend of mine, Cedric and his girlfriend Lorraine. Eduardo Jaime was the entertainer that night. In those days crayfish was not SQ but Cedric and I had heard that they served a good meal of them there. So to impress the chicks, we had decided before hand that was what we were going to order. Now both of us had no idea what the meal would cost plus drinks etc. I remember as I was about to leave home, my mother asked me, knowing where I was going, if I had enough money with me. I think it was about R25 that I had and she said you better take more just in case so I doubled it to R50 which was quite a lot of money. Well we all had the crayfish tails, drinks etc. and when the bill came, Cedric turned to me and quietly said “China have you got any spare start ?” Start was slang for cash. He had come along with about R20 and it did not quite cover his share. So there I was slipping him some notes under the table. Thanks Mom. The small hotel Sol’s parents owned if I am not mistaken was The Astra in Russell Street. Later to become The Astra Retirement Home and then sold on to become student accommodation. I have come across this picture from a reference book I have which is dated 1964. It would be a picture of the Beverly Hills Hotel just completed. As I said in my introductory post I recall the hotel standing alone virtually surrounded by bush. Amazing the advance of uMhlanga in 50 years. I think the hotel which Sol’s parents owned was the Mnora in Gillespie Street. It was run as a kosher establishment. Memory also says that the Maître D in the Copacabana was Ugo Gigante he was there for some years. It was Sol’s habit to appear and stand at the end of the bar just as the cabaret began and then disappear as it ended. Brings back memories. Beverley Hills Hotel was known for high prices – If my memory is correct the going rate for a Crayfish main course was around R3.00 in the 60’s. (or was it 3 Pounds?, I dont even have a pound sign on my keyboard!) Chicken was about the same price or sometimes more expensive than Crayfish. I used to prefer the Oyster Box Hotel, next door to the Beverley Hills, had a lighthouse in front of it. Crayfish was about R6.75 in 1971. I worked at the Copa with the Four Saints 71 & 72. Mr Gigante was there and Mr Ointmann ( GM ) who took over from Sol. Mauve Shanguin had just left to go with Sol. It was The Place to be. Many Caberet Artists I met. I was only 20 and the rest of the guys were in their mid 30’s. Pierre Martine recommended me for the position.